Your device requires a trustworthy wireless connection. Equipped with industry-leading high-performance 5GHz (802.11ac) Wi-Fi, the SGX 5150 ensures reliable and persistent wireless enterprise connections and bandwidth for high-speed data processing. The SGX 5150 was designed from the ground up to support critical enterprise, government and military grade standards, so that your private data is delivered securely with absolute data integrity. IoT deployment and network integration has never been easier. 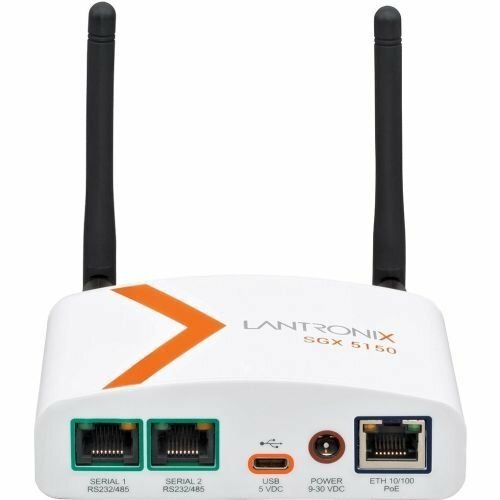 The SGX 5150 includes essential IoT apps that deliver multi-interface connectivity, full networking, extensive security, industry-leading device configuration management and robust system diagnostics so that you can quickly accelerate to an IoT business solution. The SGX 5150 provides multiple interface options to connect to virtually any edge asset with singular or multiple RS-232/485 serial ports, USB 2.0 with host and device modes and Ethernet interfaces. The SGX 5150 provides an elegant and robust solution for organizations seeking compatibility with multiple devices or product lines.